We DO NOT breed white or Albino Rottweilers and DO NOT approve breeding them! 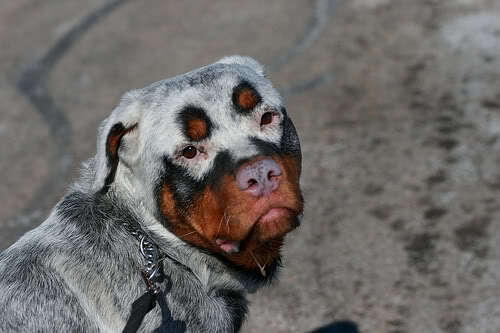 We would like to believe that a white or albino Rottweiler would be cool, but that is far from the truth. Most cases (about 90%) a white Rottweiler is white from either having a mix of another breed in the bloodline, or the dogs were inbred, overbred or both. 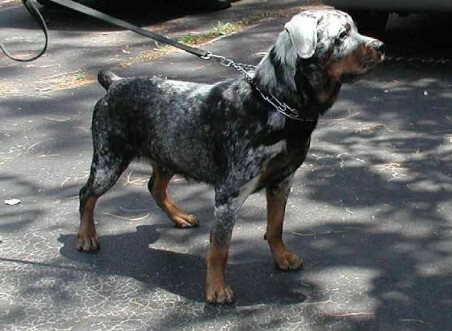 A mix breed for example would be a Rottweiler bred to a white German shepherd. The result would be whoever has the dominant gene or each dog may contribute different genes together. The puppy may have all the physical characteristics of a large robust rottweiler with a completely white coat of hair. Inbreeding is taking very close relatives such as; father to daughter, and producing a puppy. The puppy can come out albino because a recessive gene gets broken. If one gene does nothing then the gene is broken. 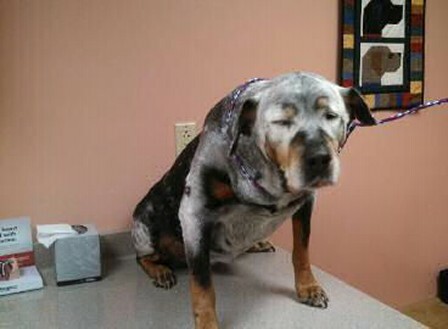 White Rottweilers have worse health problems. Results can be a poor immune system and can suffer from illness. The illness can be a little as a slight cut and the body cannot fight the infection. 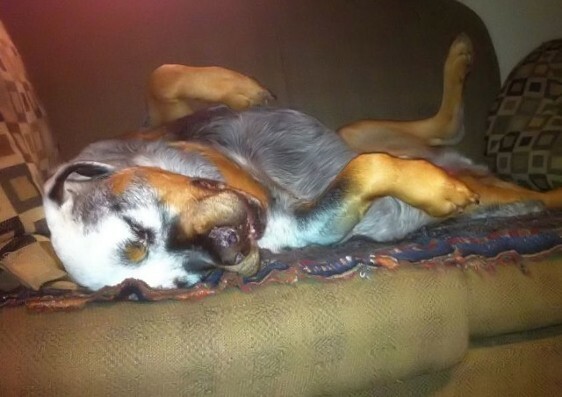 Very bad mutations and conditions such as; hip dysplasia and improper forming of the jaw (underbite and overbite). Inbreeding can result in behavioral problems. Albino or albinism is a recessive gene, each gene makes melanin this means it is working, melanin makes the dog another color such as; brown, black, tan, or grey. The "albino gene" is not a gene that makes you albino, it is the gene that does nothing, and if that is all you have you will lack melanin and be albino. Melanin is a natural pigment found in most organisms. In animals melanin pigments are derivatives of the amino acid L-tyrosine. I personally believe this is why Rottweilers mouths turn pink. 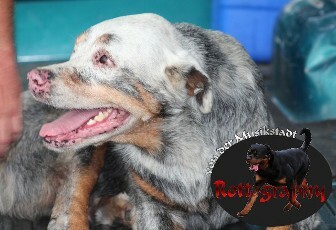 A Rottweiler may look cool a white color but their is many health issues that come from it. 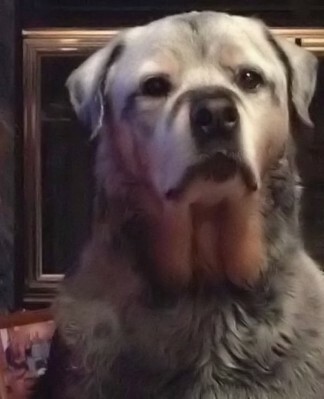 Is it possible to have a white gene in a Rottweiler? It is not proven where the white gene could of came from if it was mistakenly bred into the dogs bloodline, but it is definatly possible. 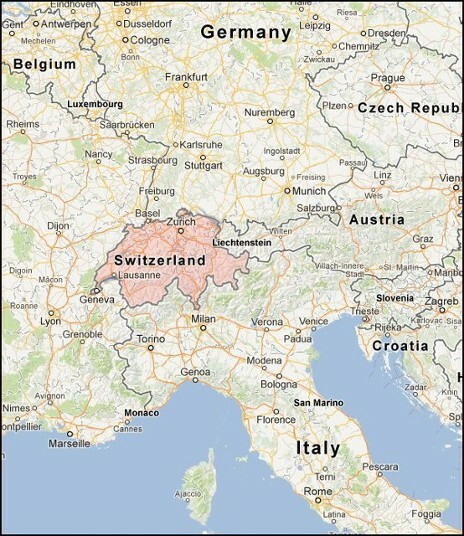 It may of came from the late 1800 or early 1900 back near Germany, switzerland and Italy borders. Switzerland reconized the Berger Blanc Suisse (German: Weisser Schweizer Schaferhund, White Swiss Shepherd Dog) on April 3, 1899. The first documented German shepherd in Switzerland was named Horand Von Grafrath that has on record a white German Shepherd gene. 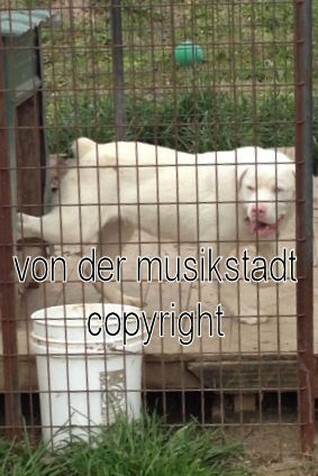 Horand Von Grafraths' grandfather was Greif vom Sparwasser # SV-ALT 990217, the first white German shepherd on record in switzerland. We do not know Greif's litter date, but on record by the European database he had one litter resulting in 1 puppy on record. The puppies name was Lene vom Sparwasser # SZ 156, D.O.B 01.01.1884. This fact shows that Greif probably would of sire this litter within 12 years dating back to 1872. I did some research in the working dog data base following the bloodlines to the present 2012 year. On record I did not find a dog with the white pure gene come out in any dogs pedigree. This does not mean that no puppies were born pure white. It is possible any puppy born white was killed after birth because the white gene was unfavorable or people wanted to breed out the gene. Then the owners never recorded the white puppy. Unfortunately without a picture on record we cannot tell if another pure white German shepherd was born in that bloodline. The gene in the white Swiss Shepherd was proven to be a recessive masking gene, bleaching the pigment from a colored dog, keeping the dark eyes, black lips, nose, pads and nails. It is not linked to deafness or albinism. 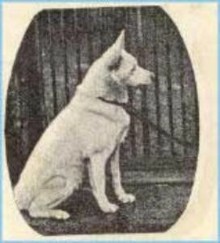 Now we have proof the pure white German Shepherd existed in 1884, then this would put different breeds of dogs all over Europe around the time frame Rome started takeovers in other parts of Europe. The Romans marched through Switzerland, Germany and Austria bring their own large Roman dogs and probably taking puppies from litters in Switzerland, Austria and Germany for themselves and even allowing or unknowlingly breed their Roman dogs with any local dog on the Journey. Everything is speculation but not impossible, this also would make sence throughout history. The white German Shepherd dog could of traveled through Switzerland to Germany breeding to any and or all local female dogs near Rottweil Germany. Another white dog is the Czechoslavian Slovac Cuvac mountain dog documented far back into the 17th century by the Czech Republic or formally known as Czechoslavakia. The dog was long in coat and pure white. The long coat here could of been bred into the Rottweiler but speculation is the Bernese Mountain Dog is responsible for the long coat gene in the Rottweiler. A Hungarian dog breed named the Kuvasz or Kuvaszok was also pure white. The origins lay with a nomadic tribe around 2000 B.C., the tribe moved along the country bringing the dogs for protection and herding. Germany also invaded and conquered parts of Europe. One country was Hungary where the Kuvasz protected the families and livestock. It is documented that by the end of World War II, nearly all the Kuvaszok dogs had been killed. The dogs extreme reputation for protecting their families were reconized and actively sought and killed by German and Soviet soldiers. 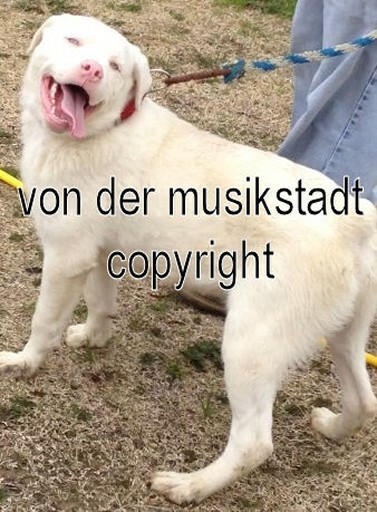 Some German police took the Kuvaszok dogs home with them, now bringing another possibility of a white trait to be bred in the Rottweilers bloodlines. Each factor implied here could be a possibility to have the gene in the bloodline, but one fact is Germany (ADRK) did not try to breed other dogs in the Rottweilers bloodline. Germany had goals for the Rottweiler Breed in 1907 and is today still followed by their breed standard. It is possible that some sneeky or untrustworthy people bred other dogs into the bloodline before 1907 to create size, and though it is not documented, it is possible they could of hidden the trait. Dogs were not given a DNA profile until reciently. 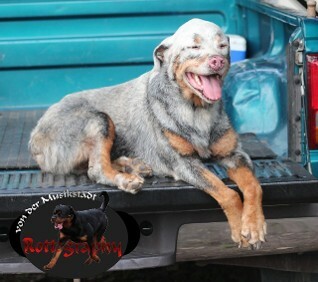 Since the black and tan trait is dominant then it is possible the first Rottweilers on record could have any white trait in is gene. 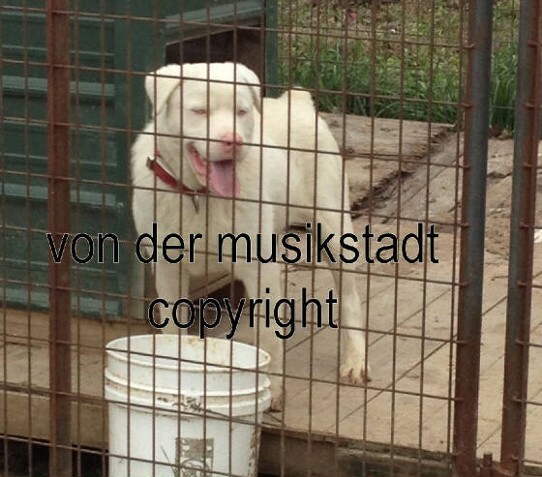 Picture of white albino rottweilers below. 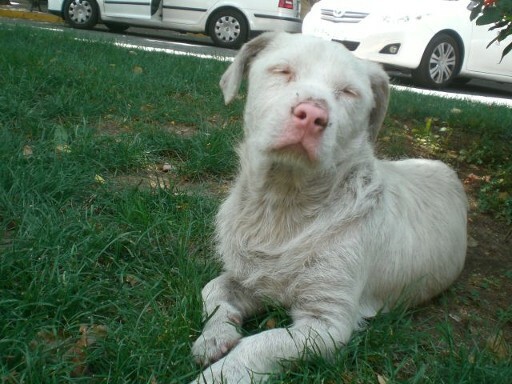 Albino dogs do not produce melanin. Albinism is a disorder and has bad health problems. 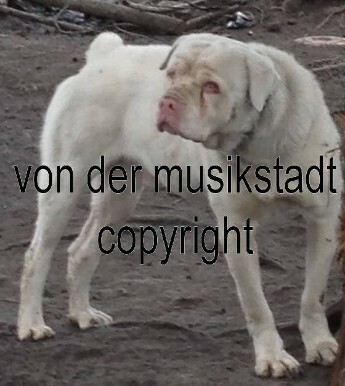 Albino Rottweiler - white fur, yellow or red eyes, pink skin, nose, mouth and lips. This Rottweiler is a Albino. There are different types of albinism but it mainly effects the eyes, hair, and skin. There can be vision problems from abnormal developement of the retna. Unusual patterns for sending nerve signals from the brain to the eye. It is possible to develope blindness, lazy eye, photophobia, wantering eyes, distortion. The hair would be white. The skin would be a patchy or complete absence of white because of the melanin pigment leaving the body. Other symptoms in animals could be problems with bowels, breathing problems, deafness, increase of susceptibility to infections, and nervous system disorders. We DO NOT breed white Rottweilers! 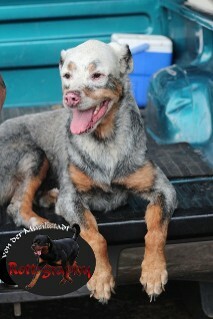 We do not approve breeding Rottweilers with this disorder! This Rottweiler is not albino. This is a disorder called Vitiligo or Leucoderma, also found in people. The fur looses it normal color due to altered process of melanin (pigment) formation or from destruction of melanin cells. Vitiligo is an auto immune disorder . The antibodies are fighting against it's own melanocytes. Notice the eyes, muzzel and parts of the body still have color. Emotional distress is a major triggering factor. The Rottweiler female below turned white within 2 months time, she streesed so much from anouther dog beating her up she couldn't handle it! 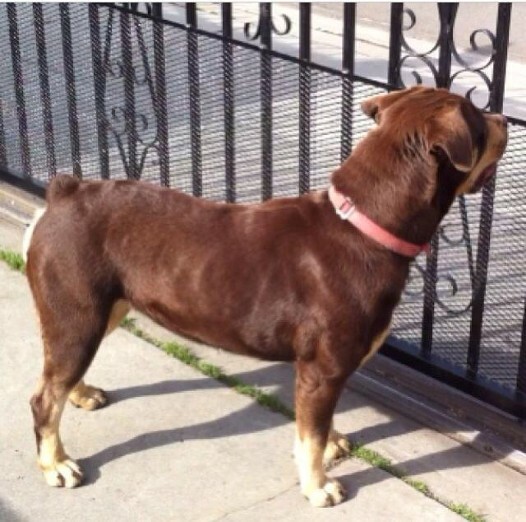 Brown Rottweilers are a genetic defect in the DNA. This is a disqualifying fault and cannot be shown or approved for breeding. 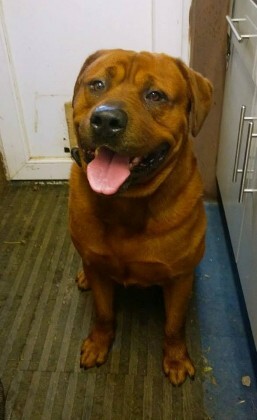 Breeding a red Rottweiler is not acceptable by the ADRK or AKC standard. 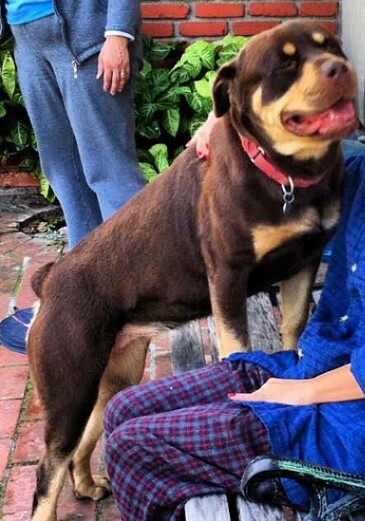 This Rottweiler is probably mixed with another breed but took the DNA to look like the Rottweiler. If it is 2 full blooded Rottweilers then the DNA is messed up.